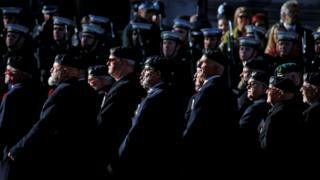 Image caption In Whitehall in London veterans attend the remembrance service at the Cenotaph. 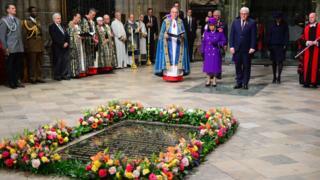 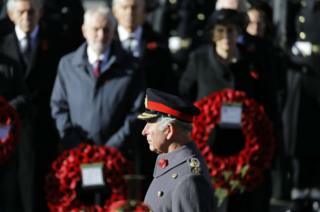 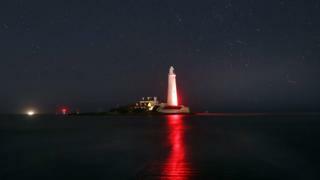 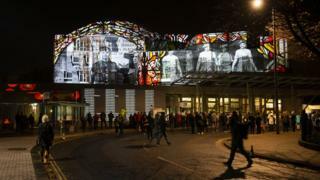 Image caption The Prince of Wales led the nation's tributes to all those who have lost their lives in conflict on the centenary of the Armistice. 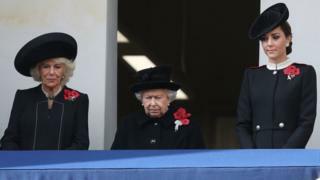 Image caption The Queen overlooks the ceremony from a balcony alongside the Duchess of Cornwall and the Duchess of Cambridge. 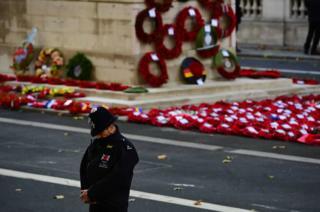 Image caption A police officer bows his head during the remembrance service. 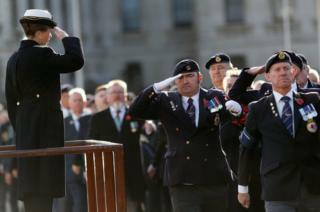 Image caption Following the laying of the wreaths hundreds of veterans take part in the annual parade. 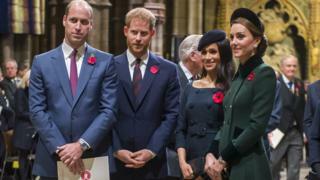 Image caption Armistice Day falls each year on 11 November to mark the day in 1918 when the fighting in World War One was stopped. 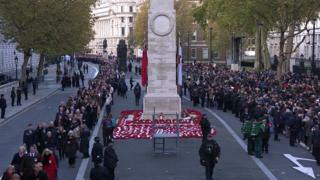 Image caption A guardsman during the remembrance service at the Cenotaph memorial. 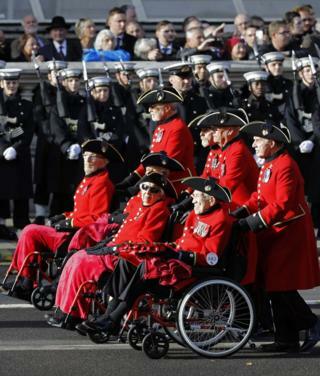 Image caption Chelsea pensioners in their red uniforms. 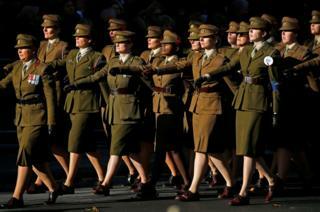 Image caption The women of The First Aid Nursing Yeomanry take part. 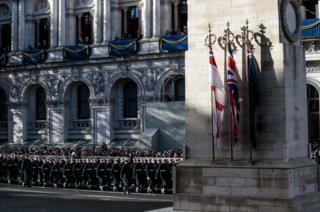 The unit was founded in 1907. 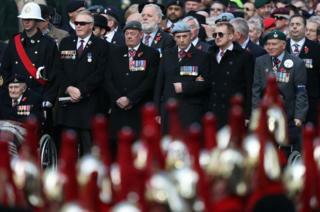 Image caption Princess Anne salutes military veterans as they march past on Horse Guards Parade. 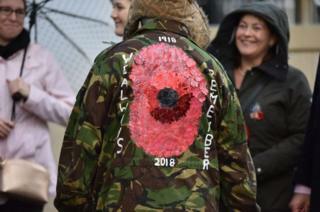 Image caption Ten thousand people took part in the People's Procession which began at the Mall and ended at St James's Park. 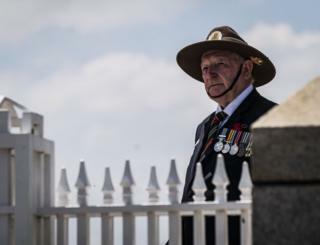 Image caption On 32 beaches around Great Britain the faces of those who served during World War One are being created in the sand. 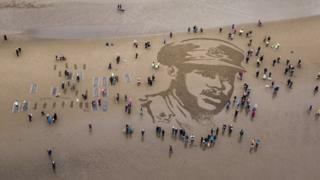 A picture of the British army's first black officer Walter Tull is seen on Ayr Beach. 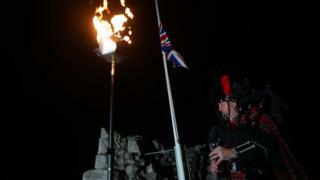 He enlisted in the Army in 1914, rose to become a 2nd Lieutenant and died in the Second Battle of the Somme at the age of 29. 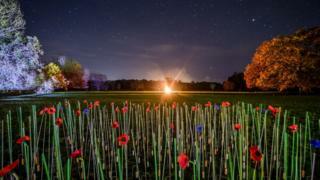 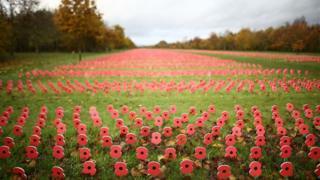 Image caption Poppies fill the Centenary Field of Thanks at the National Memorial Arboretum, Alrewas, Staffordshire. 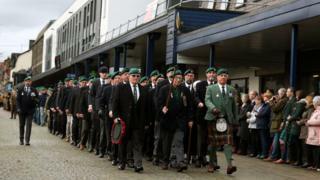 Image caption Veterans take part in a remembrance parade and service in Fort William, Scotland. 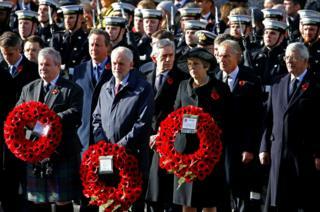 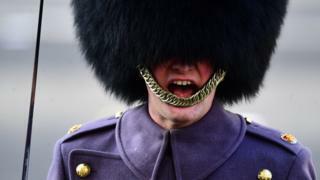 Image caption A member of the public queues to attend the memorial service in London. 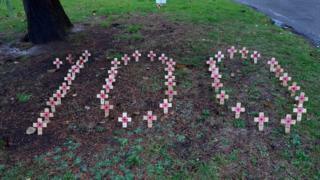 Image caption In the grounds of St Mary's Church in Isleworth wooden crosses are arranged to mark the centenary of the end of the Great War. 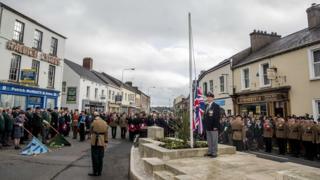 Image caption The union flag is seen at half mast at the Enniskillen Cenotaph in County Fermanagh, Northern Ireland. 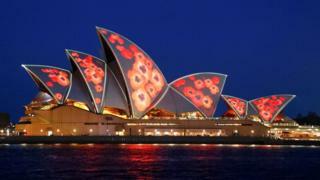 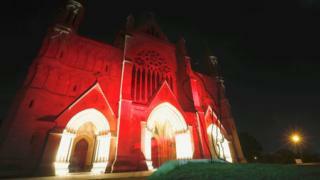 Image caption Red poppies are projected on to the sails of the Sydney Opera House in Australia. 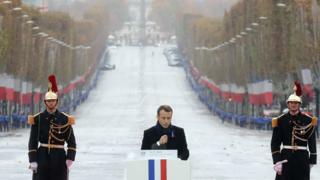 Image caption French President Emmanuel Macron leads the commemoration at the Arc de Triomphe in Paris. 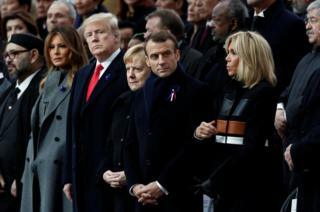 Image caption Mr Macron was playing host to 70 world leaders, including US President Donald Trump and German Chancellor Angela Merkel. 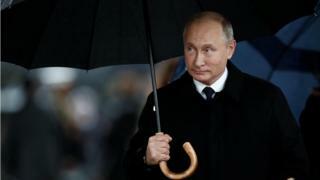 Image caption Russian President Vladimir Putin is also in attendance. 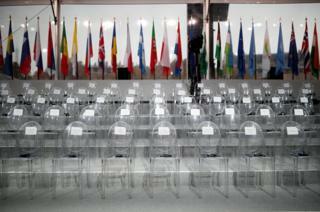 Image caption The empty chairs with the names of the world leaders are seen before a commemoration ceremony for Armistice Day in France where much of the conflict took place. 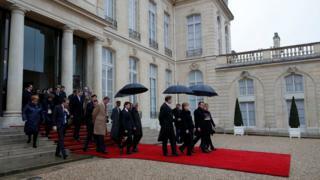 Image caption French President Emmanuel Macron, his wife Brigitte Macron and German Chancellor Angela Merkel walk ahead of guests as they leave the Elysee Palace. 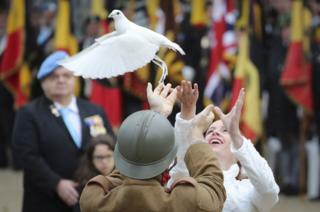 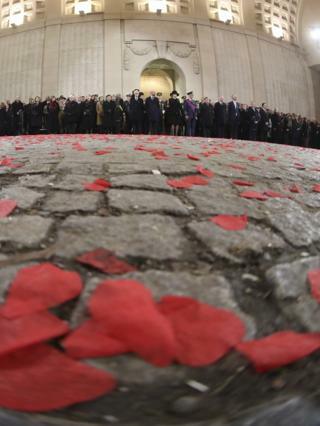 Image caption A dove is released at the tomb of the unknown soldier at Congres Column, in Brussels, Belgium. 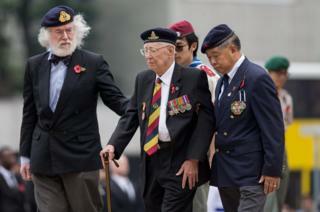 Image caption Veterans make their way from the cenotaph in Hong Kong having laid their wreaths. 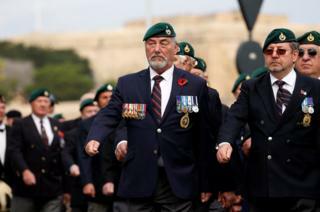 Image caption British Royal Marine commando veterans parade past he cenotaph in Floriana, Malta. 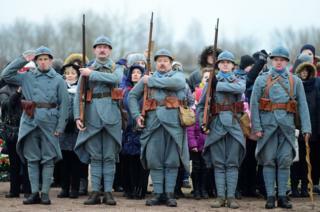 Image caption Members of military history clubs wear WW1 French military uniform during a ceremony at the Brotherly cemetery of WW1 heroes in Tsarskoye Selo outside Saint Petersburg.